One of the great violinists of our age – Leonidas Kavakos – recently led a unique two-hour masterclass at Royal Birmingham Conservatoire, part of Birmingham City University. The masterclass for Royal Birmingham Conservatoire strings students not only marked the violinist and conductor’s inaugural visit to the new £57 million institution, but it was also the first time Kavakos had hosted such an event at any of the UK’s Royal Schools of Music. 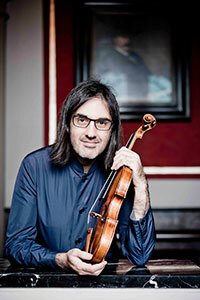 Leonidas Kavakos is recognised across the world as a violinist and artist of rare quality, acclaimed for his matchless technique, his captivating artistry and his superb musicianship, as well as for the integrity of his playing. Kavakos works with the world’s greatest orchestras and conductors and is a frequent recitalist in the world’s premier recital halls and festivals. His Royal Birmingham Conservatoire masterclass took place on Friday 14 December, which was also the last day of the University’s autumn term. 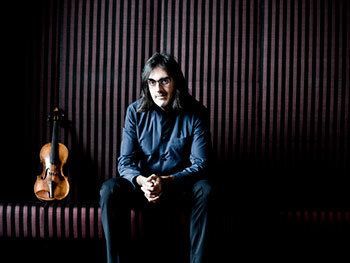 “We are delighted to welcome Leonidas Kavakos to Royal Birmingham Conservatoire. This is a unique opportunity for our students to learn directly from one of the greatest musicians in the world today. It could literally be a life-changing experience for them. By the age of 21, Kavakos had already won three major competitions: the Sibelius Competition in 1985, and the Paganini and Naumburg in 1988. These successes led to his recording of the original Sibelius Violin Concerto (1903-4), the first recording of the work in history, which won the Gramophone Concerto Recording of the Year award in 1991. After many years with Decca Records, Leonidas Kavakos signed an exclusive recording contract with Sony Classical in June 2018. This signified a welcome return to the label as Kavakos initially recorded the Mendelssohn Violin Concerto and Mozart Concertos, conducting and playing with Camerata Salzburg. More recently, Kavakos joined Yo-Yo Ma and Emmanuel Ax for a highly successful recording of the Brahms Trios for the label. Kavakos’ first solo project with Sony will be the Beethoven Violin Concerto and Beethoven Septet, which will be recorded with the Bavarian Radio Symphony Orchestra, followed by a project to record the complete Bach solo Sonatas and Partitas. In addition to being one of the world’s most sought-after solo violinists, Kavakos is also a regular chamber music partner of such luminaries as Yuja Wang and Yo Yo Ma. He was also awarded Gramophone Artist of the Year 2014. Kavakos plays the ‘Willemotte’ Stradivarius violin of 1734 and owns a modern violin made by Royal Birmingham Conservatoire’s International Consultant for Stringed Instruments, Florian Leonhard. Born and brought up in a musical family in Athens, Kavakos curates an annual violin and chamber-music masterclass in the Greek capital, which attracts violinists and ensembles from all over the world and reflects his deep commitment to the handing-on of musical knowledge and traditions.